I’ve been thinking a lot about the great discussion of FREE that I mentioned Thursday on the blog. Essentially, its the idea that by giving away information you create a caring community of people who learn about you and what you have to offer as a crafter. It’s a big part of blogging. We give away information, tutorials, tips, etc. I love reading blogs, and I love creating useful posts. I’ve been thinking a lot about how I want my blog to be structured, and I’ve been thinking I’d like to do even more on the tutorial side, too. One of my other favorite free things to do is interact one-on-one with users of my patterns. 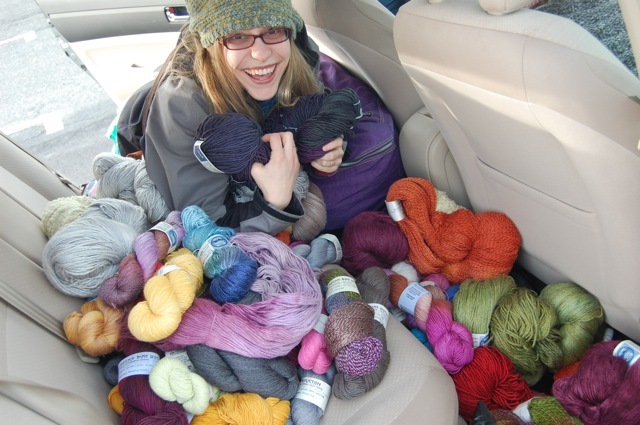 Occasionally, but not too often, knitters and crocheters will write me with questions and I enjoy helping them. Often it helps me identify what might be a tricky bit in a pattern, and what might be a concept that I could explain better. So if you would like help or advice on a pattern of mine, please feel free to contact me, via e-mail: (aoh@ipsmedia.com), or ravelry (amyo) or twitter (plainsight). I look forward to hearing from you. Speaking of free, this is a good bit of the yarn that was sent up by generous Portland yarn dyers for members of Cat Bordhi’s visionary retreat to try out. (Thanks to Leila Wice for taking the picture.) Seeing, touching and working with new yarns is such an important part of the design process. We are all so grateful to the yarn companies who donated the samples.